They made jewelry, buried their dead, and left behind haunting abstract paintings on the walls of their caves. Now a new finding in Gibraltar, one of the last regions of the world where Neanderthals survived, is further evidence that Neanderthals had a recognizably human culture. We've known for almost a decade that early humans interbred with Neanderthals, and there is evidence that the two groups may even have shared caves. And the more we've learned about this group of thick-browed, barrel-chested people, the more likely it seems that they were simple an example of early human diversity rather than a separate species. This newly-announced discovery, of dramatic carvings in a cave wall (see top image), helps build up a picture of Neanderthals as a group with many of the characteristics of paleolithic humans. They had tools, lived in small communities, and created symbolic art. Their toolkits were not the same as those carried by Homo sapiens at the time the two groups met, over 60 thousand years ago in Europe and the Middle East, but they might be equivalent. Previously, we've found Neanderthal art that included red ochre handprints on cave walls. 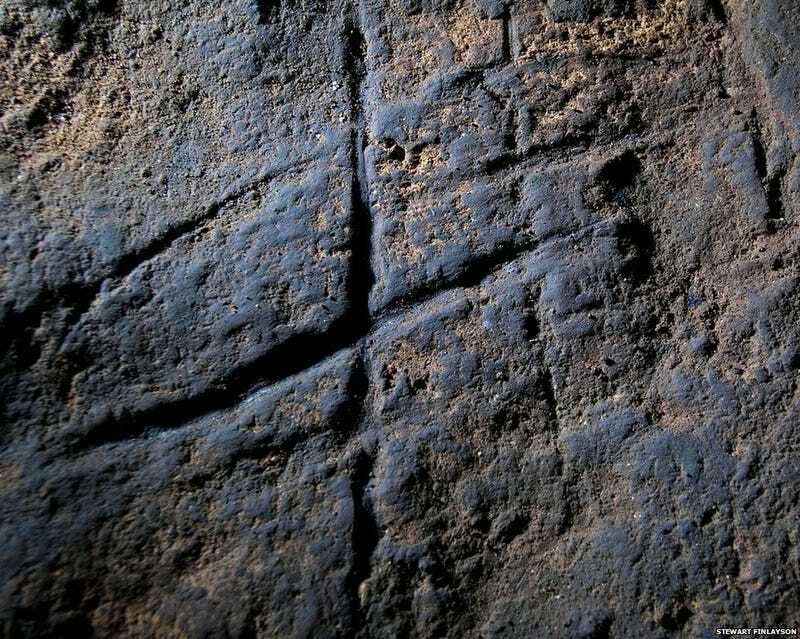 This new discovery is of a set of markings in something like a tic-tac-toe pattern (New Scientist cheekily dubbed them a "hashtag"), carefully carved, roughly 40 thousand years ago. World&apos;s Oldest Cave Art FoundâMade by Neanderthals? Scientists found the carving in close proximity to many Neanderthal tools, which strongly suggests a Neanderthal origin. In addition, close examination made it clear the marks were made deliberately. This adds to our growing understanding of how symbolism developed among humans. Often, abstract expression like this cross-hatched pattern developed earlier than representational figures of animals and humans. Even much later, in 9,000-year-old neolithic settlements of early agricultural peoples, we see far more abstract art than figurative. Ruth Blasco and colleagues discovered an abstract pattern engraved in the rock of Gorham's Cave in Gibraltar. The cross-hatched pattern was overlain by undisturbed sediment in which Neanderthal artifacts had previously been discovered, suggesting that the engraving pre-dated the 39,000-year-old artifacts. Further geochemical analysis of the mineral coating on the engraved grooves suggests that the rock art was created before deposition of the overlying sediment. The authors took microphotographs of the tool marks within the engraving, compared the marks with experimental marks made with various tools, and determined that the abstract cave engraving was likely created intentionally by repeatedly passing a robust cutting tip over the rock in the same direction, and not by incidental cutting associated with other activities. The results add to evidence at other sites that Neanderthal intellectual capacity may have previously been underestimated, according to the authors. "There remains a rump of blinkered scholars who still consider Neanderthals to be brutish savages, little better than animals, but fortunately they are a dwindling minority," cave art expert Paul Bahn told National Geographic two years ago, when this cave art was first discovered. Now that minority is likely to grow even smaller.